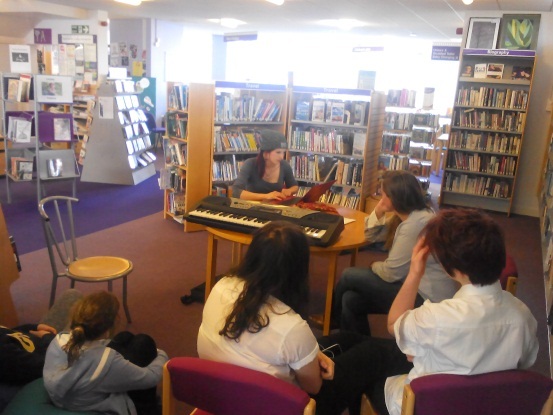 Kicking off our Creative Residences at Sherburn Library we had the amazing musician Kate Pearson come and run Song Writing sessions during May and April 2015. The age range was 13-18 year olds, but we had a couple of older and younger participants come to learn from Kate. The clear favourite, was the Guitars and Drum! 3 sessions into the work shops we had Eja (Abbi Smith, local singer/song writer) come and join us. She has had her music produced professionally so I and Kate thought it would be a good idea if we invited Abbi to stay and get involved with the young people. We had 2 young girls who were twins, who had produced a meaningful song about the loss of their father. Which we thought was very brave and inspiring of them to tackle. 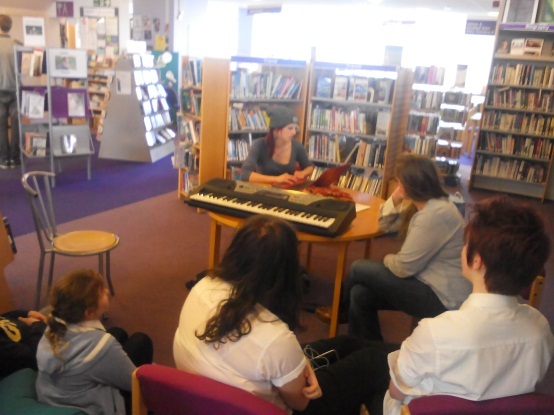 Kate and the participants discussed whether they wanted her or someone else to perform their songs, but they were more keen on spending the time continuing writing, and keeping the project as one emphasising process and writing as opposed to performing. The participants used the sessions as a way of finding their voices. Listening to an example of Eja’s music. The youngest attendee of the sessions was learning to play the Guitar and read music, so Kate spent time encouraging him and teaching him. His mum was very impressed with what he had learnt in such a short space of time! Customers who were visiting the Library during the sessions, had all said, how nice it were to see Young People in the Library. So as the end of the Song Writing came, we said goodbye to the lovely music which was being played, and hello to the next round of creativeness… Felting!! Sherburn Library eagerly awaited the four Saturdays at the end of September and early October for the arrival of Lee and Dawn. Our aim of the Workshops was to involve families in the local community, with the emphasis been on lots of parental participation. So the Library was already excited by the high demand for tickets, resulting in a complete sellout. The first session named Cartoon Creations was a masterclass in drawing cartoon characters. Those involved were quickly engrossed in creating their favourite cartoon characters. Even the novices soon gained their confidence and were producing drawing of everyone from Dumbo to Batman. A selection of the cartoon characters. Everyone busy creating characters, soon to be animated. 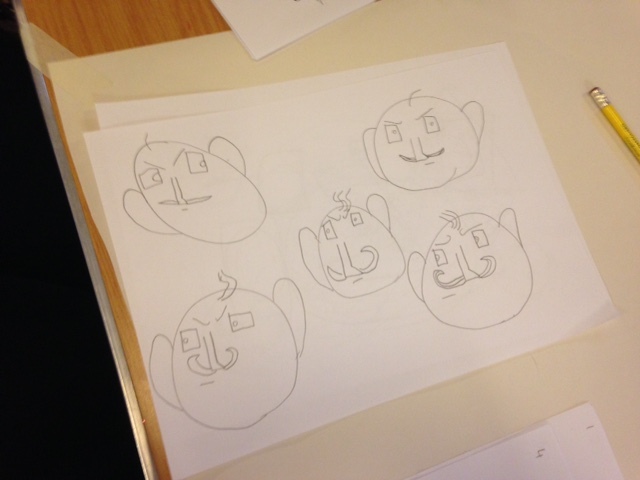 These skill were added to at the following Animation Workshop, when the families were taught how to bring these drawings alive by adding movement. 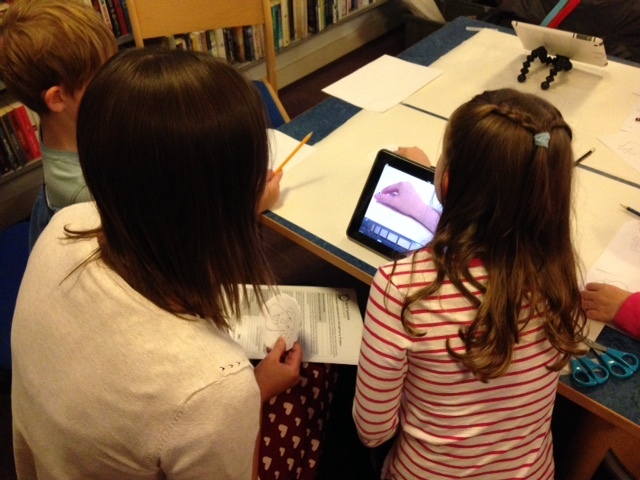 Using child friendly websites and technology, the families were taught how to create their own cartoons. One of the Mum later commented how excited and enthusiastic her children were about this new skill. She went on to describe how the rest of the weekend had been spent creating short cartoons using legos and toys as props. To view a selection of the animation created please click on the link below. The third Saturday was titled Storytelling. It immediatly became apparant what an amazing Storyteller Lee was. 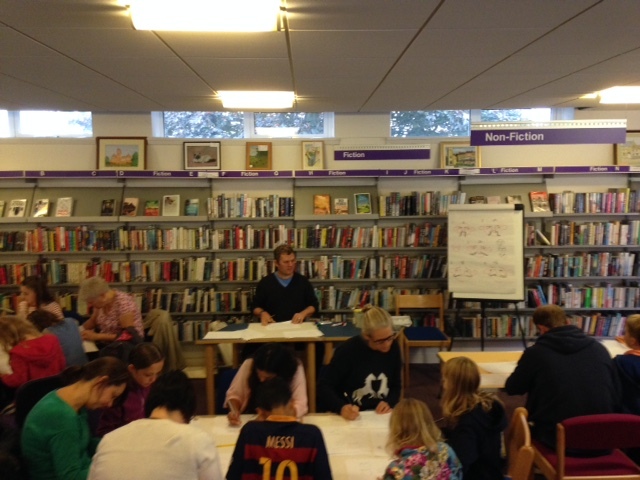 Without use of props or prompts he very quickly had the families engrossed in a world far away from Sherburn library. Lee invited children and adults to participate in the stories, inviting them to choose random object which he went on to seamlessly include in the story. Shadow Puppets was the subject of the final workshop. A great deal of glueing and sticking was involved as families began creating the characters and props which were later to appear in their own productions. Soon everything from witches cauldrons to ferocious looking fish began to make their appearances in pieces of shadow style theatre. I personally felt elated to see such an event hosted in the branch. It was the proffessionalism of Lee and Dawn, the enthusiasm of parents and children, and the determination of library staff to make it work, that all added to it’s success.